Hifly X has finally proved ownership of National flag carrier, Nepal Airlines Corporation (NAC) in newly purchased Airbus A330-243 series aircraft. A few days ago, there was a discussion that these two wide body aircraft were leased from Hi Fly Company. The company which sold A330 to NAC published Press Release stating that both aircraft’s ownership is completely with the corporation. The press release of Hi Fly Company has straightly cleared all the doubts and rumors on the issues in irregularity of the procurement process of widebody by NAC. The press release of Hi Fly Company which was issued on August month, 2018 has finally been public. In the press release, Hi fly Ireland limited sold two new Airbus A330-243 wide body aircraft to the corporation. A330-243 with the Manufacturer serial number (MSN) 1872 and 1878 were delivered to NAC in June and July month of this year. 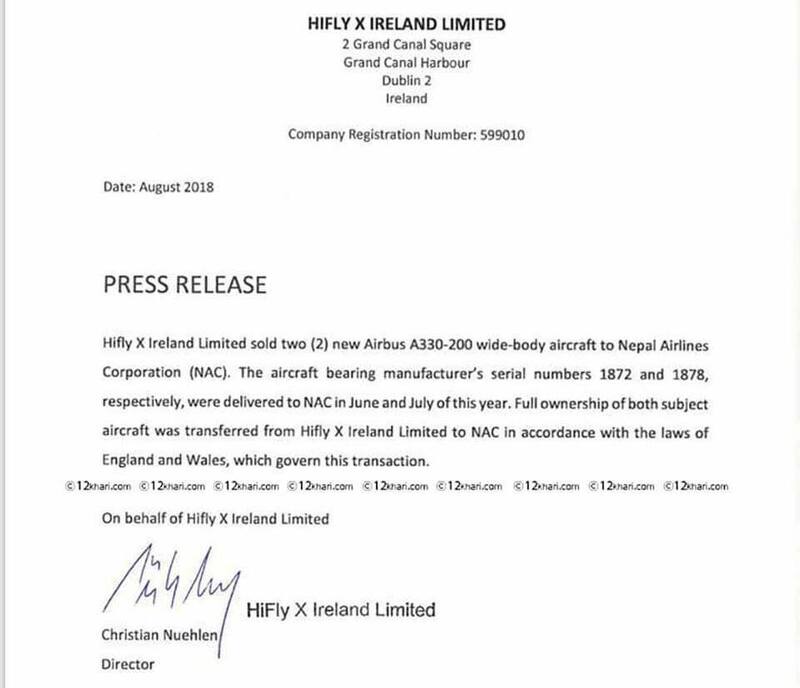 It has also mentioned that Hifly Ireland limited has transferred full ownership of both aircraft to NAC under the laws of England and Wales. In the press release of Hi fly Ireland limited, Christian Nuehlen, director of the company has signed. National flag carrier received its first wide-body aircraft A330-243 ‘Annapurna’ with registration ‘9N-ALY’ on June 28, 2018 that started its commercial operation to Doha from 1st August 2018 and expanded its destination. After one month arrival of A330-243 ‘Annapurna’, second Airbus A330 “Makalu” with registration “9N-ALZ” was delivered. Both aircraft have a 2-class cabin configuration with the total capacity of 274 passengers allocated between Business class (18) and Economy class (256). The carrier borrowed NRs. 24 billion from the Citizen Investment Trust (CIT) and the Employees Provident Fund (EPF) to fund the purchase. The Portuguese ACMI/charter specialist is part of a consortium of three firms whose two other members are AAR Aircraft Sales & Leasing and the German Aviation Capital Corporation (GACC), that won a tender for the supply of two A330-200s – provisionally msn 1845 and 1854 – to the Nepali carrier earlier this year. The corporation paid all dues in three installments. According to a high official of Tourism Ministry, the aircraft had to be stated as leased until the three installments were not paid but the rumors have spread false information saying that the aircraft is fulling leased. According to a business plan prepared by the corporation, 3 flights will be operated weekly by its A330 to Japan, Korea and Saudi Arabia. Previously, 3 representative delegation from Japan arrived Nepal for attaining the meeting between high officials of Japanese team and NAC on December 3 discussing on the topic of NAC resuming its flights to Osaka. Japanese team has expressed supportive attitude saying that Japan will help NAC to operate flights.